People podcast for many reasons, however I don’t seem to have any of these reasons myself, but still wanted to experiment with this new medium. So I did the next best thing and decided to record and produce podcasts for others. Podcasting is a mainstream phenomenon, largely thanks to the ubiquitous iPod. Virtually anybody can produce their own podcast with a cheap microphone and a personal computer. Just because you can though, doesn’t necessarily mean that you should. You may have a blinding idea for a podcast, with great content, but do you really want to let it all down by producing a poor quality recording? Some things we’re good at, others less so. So there are two options; either learn new skills and invest in the equipment required to produce a professional sounding podcast, or pay someone else to do it. I’m obviously hoping people will choose the latter! 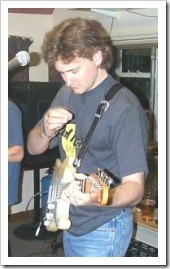 I’ve been involved in music production and recording from an early age. Since getting my first guitar at the age of fourteen, I was not only keen to play the instrument, but also enjoyed recording and producing music with a small home studio. My past experience of recording, coupled with my electronic engineering background and more recent web development activities, placed me in an good position to record and produce professional sounding podcasts. While I felt perfectly able to record podcasts fairly professionally, I was still missing a vital ingredient to the mix; the voice. I have a good friend, Winnie, who also happens to be a trained actress and has a very nice speaking voice. However, it wasn’t until I was on holiday once that I got to thinking of the potential synergy of combining our skills to record and produce podcasts for customers. After a few promising trial recordings, we set-up a page on my company website promoting our new service and were ready to go. Having what we thought was a good service, we really needed to get some experience under our belt in order to convince potential customers that we really could deliver. Thankfully an old college friend, who now runs a successful internet service provider business in the UK, Zen Internet, came to the rescue. Since March 2001, Zen Internet have been sending out monthly newsletters via e-mail to all of their customers. This newsletter contains 20 or so internet related news and views, tips and tricks and a regular search engine of the month feature. This seemed an ideal candidate for conversion into a podcast, particularly taking into account the nature of Zen’s business. 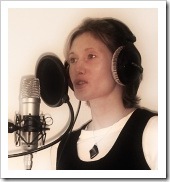 The initial recordings were made using a Shure SM58 dynamic microphone, with a home-made pop shield constructed from a bent coat-hanger with an old pair of stockings. 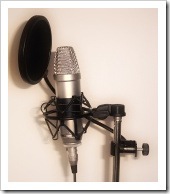 The pop shield is quite important to stop the microphone “popping” with loud sounds beginning with Ps and Bs. The microphone was plugged directly into the PC’s sound-card, which certainly isn’t ideal for making quality recordings. I used Audacity (a free sound recording and editing tool) to record and edit the podcast and produce the final MP3 file. Our first podcast was produced in June 2007, which you can hear below. Following the success of the initial trial, Zen Internet decided to make the monthly podcast permanent. As such, after a few months, I decided to upgrade my recording system, in an endeavour to produce more professional results. Up until this point I had been monitoring all of the recordings on a small pair of Hi-Fi speakers. However, as the majority of podcasts are listened to on headphones, I decided to invest in a pair of studio quality reference headphones. 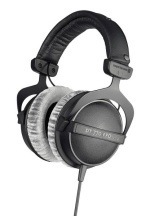 I opted for the Beyerdynamic DT770 Pro (80 ohm). These are fantastic, but ruthless. They show up every detail and flaw in a recording, which is great, because if you can get a podcast sounding good with these headphones, then you know it’ll sound just fine with the average pair of headphones supplied an MP3 player. The time had come to replace my handmade pop shield with an all together more professional affair; a K&M Popkiller and, arguably most important of all, I upgraded the microphone to a low noise, wide diaphragm condenser studio microphone, the Rode NT1-A (shown right). The microphone also came with a “cat’s cradle” type shock mount to help prevent vibrations from the microphone stand passing to the microphone. The PC sound-card was the next weakest link, which I remedied with a Focusrite Saffire firewire interface. This interface had two headphone outputs and two microphone inputs (with high quality pre-amplifiers) and compression and equalisation via built-in DSP software; plus a host of other goodies. This ensured that the digital sound entering the PC was as good as I could possibly get (with a realistic budget). While my upgraded equipment helped to make a big improvement in the podcast’s audio quality, a few other improvements were also made along the way to improve the general professionalism of the podcast. Intro and Outro music was added to the beginning and end of the podcast. Thankfully I had no issues with copyright as I used the music of blues musician Will Tang, the brother of Zen Internet’s Managing Director, Richard Tang. Another thing that helped to polish the overall result was the strategy that we adopted to pronounce complex URLs (web addresses) in the podcast, one that I adapted from the BBC. For those of you interested, I describe this in a previous post; How to Pronounce URLs in Podcasts. To help brand the podcast, and present a professional image, the Zen company logo was added to the podcasts via the ID3 tagging feature of MP3s. If you’re not sure how to add an image to an MP3 file, I wrote a little article on this a few months ago that you may find useful: Embedding Album Art in MP3 Files.